Each October, Lea Schizas and friends pull off an amazing online conference. This will be the fifth year and I can only see it getting better. I’ve attended the past few years and each one improves on the last one. Bigger chat rooms, forums, and editor pitch sessions are some of the changes I’ve seen. My first year I was so overwhelmed with access to people who could speak on such interesting writing topics I wanted to sign up for nearly every chat. And I think I did. I attended many chats and participated in the forums. There were a lot of handouts to read. As the conference has gotten bigger the workshops have gotten more intense. The workshops last the entire conference and if there is one day you fall behind, it is difficult to catch up. These are extremely hands on and some people are known to take vacation time to make sure plenty of time is available. Even the presenters take time off! There is still time to sign up for the conference if you want to do a writing boot camp. You will definitely be put through your paces. Sorry about posting this a day late; I spent most of yesterday driving back to Ohio from North Carolina. To be honest, I didn’t do any of the driving. Mostly I read and slept. My beach vacation is over. Yes, my drabble has been out 248 days waiting to be acknowledged. If I don’t hear something this month I will definitely go ahead and consider it rejected. The market still has a backlog of submissions to sift through but they are also sending out acceptances for pieces that arrived after mine. 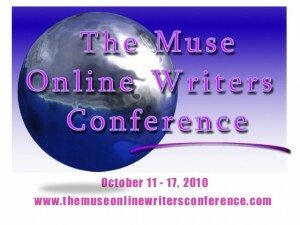 This month I attended the Muse Online Writers Conference. The short story I was hoping to edit and send out based on the feedback I received at the conference didn’t happen. It needs a lot of work and I’m not entirely certain where to begin. But the good news is that I was able to edit another short story and it’s what I sent out in October. I also updated my bio page with feedback I received from the conference. Without a doubt, there is more to last month’s writing progress but my brain is a bit mushy at the moment. I’ve been writing off and on today in order to catch up to the daily word count needed to complete NaNoWriMo this year. I’m about to begin writing Chapter Four and I’m not sure yet what’s going to happen. Hopefully my Inner Editor will stay away and I’ll get to see what happens. I’m at Topsail Beach this week in North Carolina on vacation. I may be taking a break from my day to day responsibilities but I’ve not been taking a break from my writing. One of the workshops I attended at The Muse Online Writers Conference was “Write that Bio With Sheri Gormley”. Sheri is the Director of Marketing and Promotions for Virtual Tales. Authors are told repeatedly to have a web presence before their first work sells but few know what to include on a web site. One thing all author sites should all have in common is the biography. It’s difficult for some writers to talk/write about themselves. What information will the reader find interesting? With the tips I learned at the workshop I updated my bio page. Another workshop I attended was “Organizing Your Writing Life with Cheryl Malandrinos”. Cheryl is a freelancer, copywriter and aspiring author who understands how the writer’s mind works since she’s one herself. One of her tips was to take a SMART goal and break it down into smaller tasks. It sounds so simple but a lot of people get hung up on the volume of tasks and never get started. One of my SMART goals was to hit my daily word count in November. In order to accomplish this, I’ve brought my character pyramid sheets with me and I’ll have my characters interviewed before the week is done. I’ve already begun the interview process and been surprised by some of the answers. The Muse Online Writers Conference is Educational! My eyes hurt, I’m tired and a callous is forming on my mouse wheel finger. This is the current cost of The Muse Online Writers Conference this year. Great, isn’t it? When I first heard of the conference I thought to myself, “It’s online and it’s free. It’s probably not going to be very good.” I signed up last year with no idea of what to expect. I was armed only with the knowledge that I’d be out of the town for the end of the conference and miss out on the last few days. Let me describe for you what the conference last year was like. Overwhelming. Educational. Fantastic! Last year I learned about how to world build, where to find grants, why vampires are so loved and so on. The workshops the last two years were held in week-long forums hosted on Website Toolbox and were easy to use. This is the software being used this year too. If you’ve ever used forums before these are basic and pretty easy to use. The “smart quotes” from Word don’t translate well so be prepared – turn off that feature in Word if you’re going to copy and paste your work into the forums. There is so much information, critiquing and networking being done. The organizers pay to keep the forums open a few weeks longer than the actual conference so participants can review missed discussions. The chats have been held through Parachat and have a maximum capacity of 100 logins before it starts bumping people out. I signed up for a lot of chats last year. The organizer hopes to have enough donations from this year to upgrade the software or switch to something else for chats. Each year the conference gets better based on constructive feedback. I wasn’t there for the first year, but the workshops were held in Yahoo!Groups. Yahoo!Groups is a great tool but it can be difficult to follow multiple discussions at times. Last year a request was made for transcripts of the chats. And this year most of the chat sessions have transcripts available afterwards. I wonder what will be in store for 2009? I’ve reworked a short story that’s been through several drafts already. I’ve received good/helpful criticism on a short story that’s been rejected several times but is dear to me so I don’t want to trunk it. I’ve begun a new short story with elements of suspense. I’m exploring some of the scenes that will take place in my next novel. It’s only Friday morning. There are so many more exercises to do and things to learn before the week is over. It may be a free conference but the time and effort that went into the week really shows in the quality of the presenters and the participants.